After she discovers some old family letters, Maria Altmann (Helen Mirren) decides to challenge the Austrian government in claiming what is rightfully hers – a painting of her Aunt. After the Nazi’s invaded, they stole thousands of pieces of artwork. Once the war was over, many of these painting subsequently ended up in museums. Maria enlists the help of a family friend’s son Randol Schoenberg (Ryan Reynolds) to look at the legality. Before long, they both find themselves challenging the establishment in a bid to return history to its rightful owner. 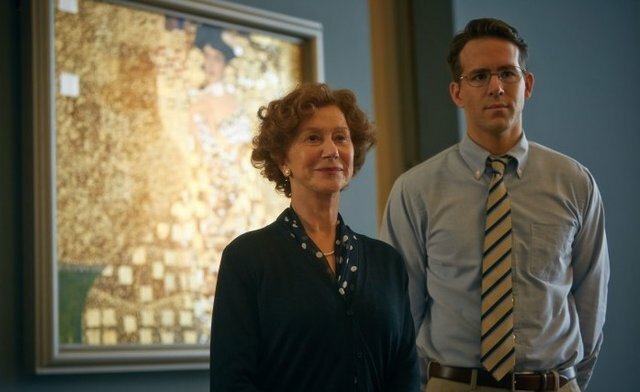 The odd-couple paring of Ryan Reynolds and Helen Mirren delight in this fascinating true story about Gustav Klimt’s painting ‘Woman in Gold’. Fact is always more involving than fiction and Maria Altmann’s quest certainly proves this. It’s such a remarkable story that it demands a strong leading duo to carry the weight of expectation. Both Helen Mirren and Ryan Reynolds really shine here and give the story two very relatable and engaging leads. The banter they share is always enjoyable to watch. We’ve seen Mirren do this type of role but Reynolds really shines here. He strips away his dashing leading man image and instead conveys this young man’s journey of understanding his history in a manner that’s engrossing to see unfold. The supporting cast are all excellent with Daniel Brühl on fine form as a reporter who wants to help the duo in their plight. Charles Dance has a small but pivotal cameo as Randol’s new boss while Katie Holmes features as Randol’s sympathetic wife. Max Irons and Tatiana Maslany do a great job visualising the past in frequent flashbacks that tell us the story of Maria’s young life. But by far the best performance in this section of the movie is Allan Corduner as Gustav, Maria’s father, who hands in a deeply affecting performance. Full of heartbreaking drama and genuine warmth, this compelling tale deserves a huge audience. A human interest story that resonates past the usual barriers, Woman in Gold is a fascinating study and one that will keep you glued to your seat, with a sprinkling of laughter and tears along the way.